SPOKANE, Wash. — Former Gonzaga basketball player Rem Bakamus shared an adorable video of his two-and-a-half-year-old nephew playing basketball – and rooting for star point guard Josh Perkins. Bakamus shared the video of his nephew Mack on Twitter. He says he has watched a lot of games with his grandpa and is a big fan of Josh Perkins. “When he shoots he says ‘yeah perk’ or ‘go perk,’” Bakamus wrote on Twitter. Bakamus told KREM that Mack is also a big fan of Baylor, where he now serves as a graduate assistant on the men's basketball coaching staff. 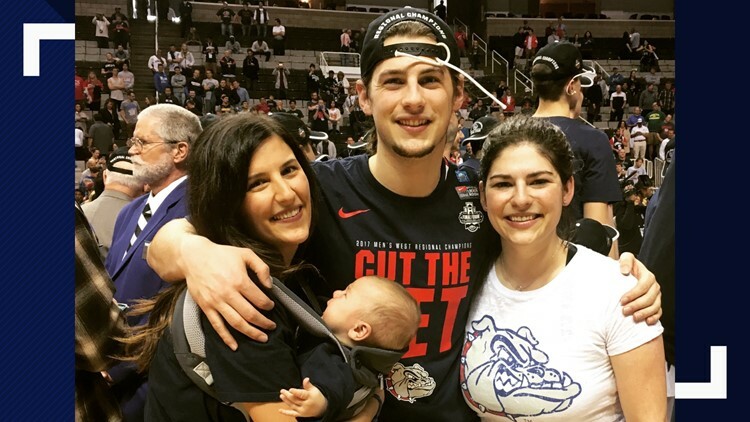 “I haven’t got to see him [Mack] much this year but he watched all the Gonzaga games with his mom (my sister Katrina Bakamus) or his grandpa (my dad Bill Bakamus),” he wrote to KREM. The tweet has received nearly 400 likes since it was posted on Tuesday. Bakamus also shared a photo with KREM of his nephew Mack watching the Zags play in Final Four in 2017. Gonzaga faced Baylor during the round of 32 during the 2019 NCAA Tournament. The Zags beat Baylor 83-71 to move on to the Sweet 16. Before the game, Bakamus gave the Zags high fives in the tunnel. He told KREM Sports Director Brenna Greene that he was scared ahead of the game because Gonzaga is that good. Bakamus said life is great after his time at Gonzaga and he hopes to be coaching basketball by this time next year.